When America’s number one male jazz singer, Sid Satin, is found dead in his dressing room at the Pacific Coast Jazz Festival, police set their sights on Dee Jefferson. She’d had a blow-up with Satin that afternoon and they believe her gun is the murder weapon. To remove suspicion from her singer friend, San Francisco PI Casey McKie sets out to find the killer. In delving into Satin’s life, Casey finds a number of people who’d like to see him dead - his ex-wife, ex-girlfriends, his agent, a producer, and a rival male vocalist. As Casey accumulates evidence, the suspect list gets shorter, until, in a climactic scene, the culprit’s identity is revealed, surprising even Casey. 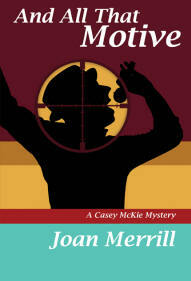 Joan Merrill has thus far written five Casey McKie mystery books. Her novels feature a female jazz-loving detective who becomes involved in investigating a murder that takes place in the jazz world. 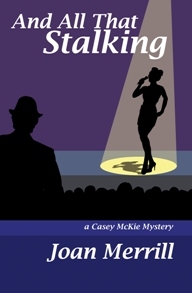 Her latest book, And All That Motive (available from www.joanmerrill.com), finds McKie trying to find out who killed a popular but unlikable jazz singer, Sid Satin, at the Pacific Coast Jazz Festival. There are an excess of suspects and motives and very little chance that readers will be able to guess the identity of the murderer before it is revealed. But more significant than the actual case is the realistic atmosphere that Joan Merrill creates. The fictional jazz instrumentalists, singers and those involved in the business of jazz all sound and act realistically, ranging from the heroic to the despicable, mixing together good and bad qualities. While reading this book, one can practically hear the bebop-oriented soundtrack. Jazz fans and those who like complex mysteries will enjoy this series. "Well established in jazz, especially in the Bay Area, Joan Merrill works as a musician’s agent, concert, film, radio and record producer. Deeply involved in the world in which And All That Motive is set, the author ably explores the highs and lows encountered by musicians. It is all believable as is the interplay between musicians, veterans and newcomers. As Merrill’s fans already know, her background ensures that when the characters express opinions and ideas about jazz as it is now and how it used to be, their words come with the ring of truth. This is a thoroughly enjoyable journey into the (hopefully fictitious) murderous underground beneath the world of jazz." "Can't tell you how much we enjoyed every word of your latest creation. Brava and then some!" All available at amazon.com, both in paperback and Kindle. Audio books are in production.